The program is designed as a 10-semester curriculum and is taught primarily in an online classroom using synchronous, high-definition videoconferencing technology. A new cohort of 5-7 students starts in odd-numbered years only and begins classes in the summer semester with a required four- to five-day session on the Baylor campus in Waco, Texas, before the first summer session begins. 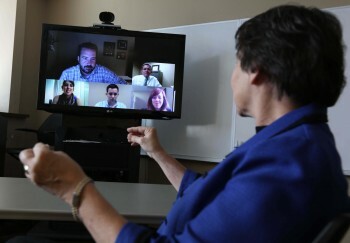 Throughout the program students will attend all of their classes in an online classroom using videoconferencing technology. Each class meets at a specific time each week, and classes meet on Monday and/or Thursday evenings from 6:00 to 9:00 pm CST. Students must be present to be a part of the class. During synchronous class sessions, students see and talk with each other as well as the instructor in real time. Classes are conducted much as they would be on campus, except that students are able to be anywhere in the world. PhD students will take one comprehensive exam at the end of the fall semester of year 2. The comprehensive exam will be structured as one exam with four major sections (i.e., theory, research, statistics, ethical use of faith and practice). The exam will serve as a checkpoint to assess that students have obtained a basic level of competence in these areas of the curriculum that will prepare them to move forward in the process of developing as scholars. The comprehensive exam and all coursework must be passed prior to enrolling in SWO 6V99 - Dissertation. Candidates for the Doctor of Philosophy degree must present an acceptable dissertation on a problem in the field of their major subject. The dissertation must provide evidence that the candidate has pursued a program of research, the results of which reveal scholarly competence and a significant contribution to knowledge. The PhD dissertation will focus on a single cohesive theme, consist of one document, and have a single defense. Each dissertation will contain three publishable articles. Each article must include a substantive review of the literature, and one of the articles may be a Systematic Research Synthesis of the literature. Two articles will incorporate data from the student’s research with one article using quantitative analysis and the other qualitative analysis. These articles will be embedded as the principle substance in a larger document that will include an explanation of the overall method of the study and a critique of the study for a total of five chapters.